Always wash your hands after handling wild lizards or cleaning their cage to prevent spreading parasites or diseases to other reptiles. Dust crickets and mealworms with a multivitamin reptile supplement once each week. It may take several feedings for a wild lizard to take crickets and mealworms in captivity since they are used to a diet consisting of different types of insects. Continue offering food until the lizard starts to eat. With their swift speed and reclusive nature, catching a wild lizard is a challenging, but rewarding task. 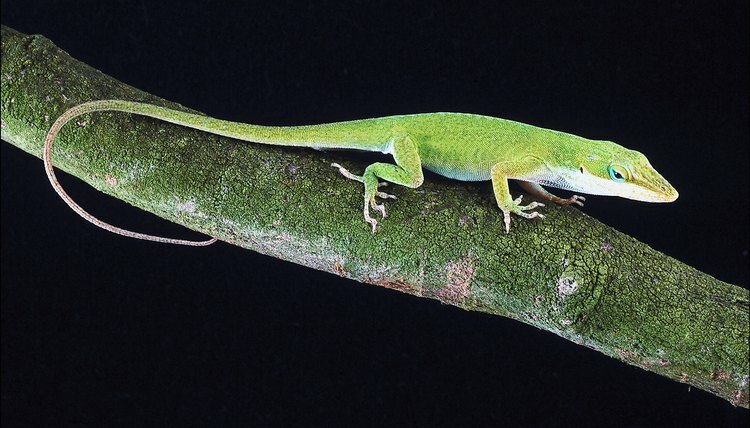 Wild lizards should always be housed alone due to the possibility of containing internal parasites or illnesses that could be transmitted to other reptile pets. Keeping a wild lizard in captivity is a simple task and requires the same housing setup and care as keeping captive bred lizards. Fill the base of a 10-gallon aquarium with an appropriate substrate for the lizard you want to catch. Design the terrarium to resemble the lizard's natural habitat to make it feel more at home in captivity; desert lizards should have a sand-based substrate, while forest lizards will feel more at home with potting soil and gravel mixture. Place rocks and driftwood in the enclosure to create solid structures for the lizard to climb on. A varied terrarium will help keep your lizard healthy and fit as it climbs around. Place a heat lamp over one end of the terrarium and measure the temperature direct beneath the lamp with a thermometer. The basking sight should be between 80 and 90 degrees. Lizards are ectothermic and require warm temperatures to maintain their body temperature. Install a UV lighting system over the enclosure. Lizards require a full day of UV light as a substitute for natural sunlight in order to metabolize vitamins and minerals in captivity. Place a reptile hiding box and a water dish in the enclosure on the opposite side of the terrarium from the heat lamp. Wild lizards will feel more at home in their new environment if they have a secure place to hide. Feed wild lizards as many crickets and mealworms as they will eat, two to three times each week. Offer dark greens such as kale, collard and mustard greens for omnivorous species. Change the water dish with dechlorinated freshwater each day and remove any feces from the enclosure as soon as you notice them.